Children’s Dental Health Month is a month-long campaign set forth by the American Dental Association on February 8th, 1949. The goal was and still is to raise awareness and highlight the importance for kids to maintain healthy teeth and gums. Dentistry for the Entire Family provides dental care for all ages. Today’s blog post is a compilation of insights from frequently asked questions we receive from parents regarding their children’s dental health. Child’s First Dental Visit. When and what to expect. Space maintainers. What are they and when are they placed? Pediatric Dentistry recommend the first dental visit within 6 months following the eruption of your baby’s first tooth or one year, whichever comes first. sit for their own teeth cleaning appointment, typically 24 months- three years old. Chair ride and introduction to the sights & sounds of tools and instruments used to clean and check teeth. Professional teeth cleaning and polish. Application of preventive dental fluoride. Personalized home care instructions for a child and accompanying parent. Examination by a dentist. Tooth growth and development, tooth decay, occlusion. About age 4-5 we will take digital X-rays of teeth to check for tooth decay between teeth as well as the future exfoliation/eruption of teeth. Call (763) 586-9988 to schedule your child’s teeth cleaning visit or click the button below to request an appointment online. 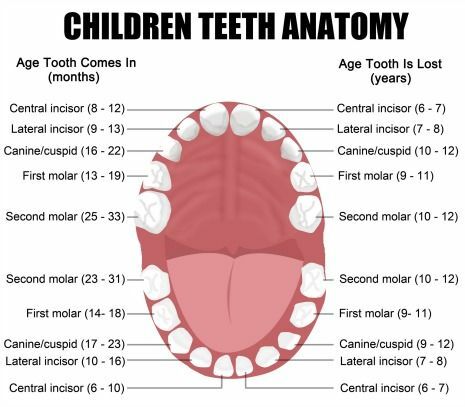 Children have 20 teeth, adults have 32. The first baby tooth erupts around six months. The timing of when a tooth is shed or erupt are dependent upon your child’s growth and development. Chilled teething rings help alleviate your baby’s sore gums as their teeth erupt. The Food and Drug Administration recommends that parents and caregivers not use benzocaine products for children younger than 2, except under the advice and supervision of a health care professional. 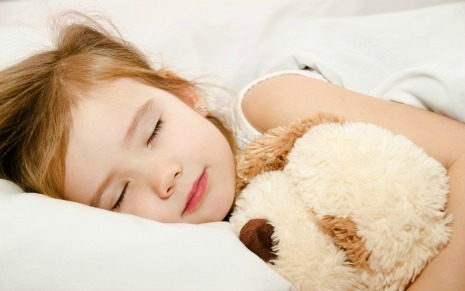 An estimated 38% of kids grind their teeth during sleep (source: Kids Health). Dental experts suspect that stress, teething, illness, and/or malalignment of teeth are contributing factors. Thumb sucking is normal for infants and toddlers. Prolonged thumb sucking beyond age can become problematic and impact the position of developing teeth and bones. Sucking is a natural innate reflex and the use of pacifiers mimic this reflex to provide comfort and decrease stress. Prolonged use of pacifiers, like thumb sucking, can become problematic and impact teeth and jaw growth and development. 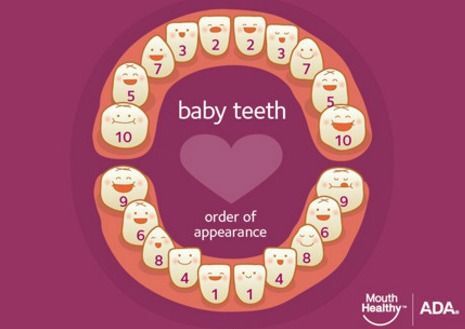 Primary teeth will be later replaced by permanent replacements. Growth signals from the body trigger primary tooth roots to dissolve as the developing permanent tooth matures and begins to erupt through the gum tissue and into the mouth. Most kids lose their first tooth between age 5 and 7. Generally speaking, the order at which your child will lose their primary teeth is similar to the order in which their primary teeth erupted. See the chart above. 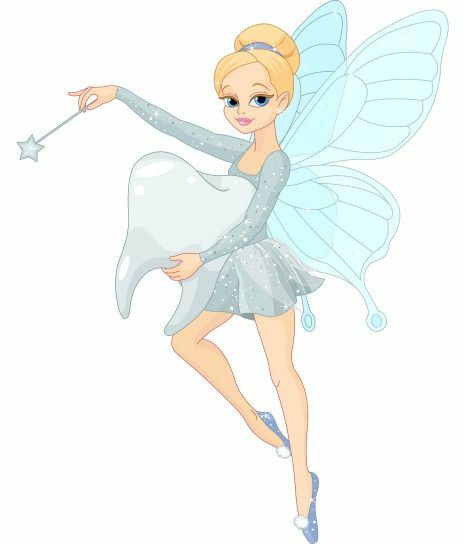 Kids are naturally curious when they discover they have a loose tooth, especially when they learn about the potential reward from the tooth fairy. If your child loses a primary tooth prematurely or there is a congenitally missing permanent tooth, your dentist will recommend placing a space maintainer. 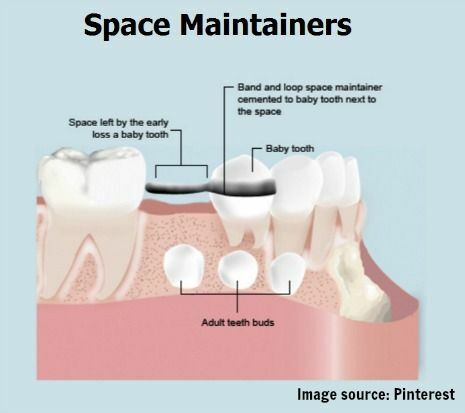 A space maintainer will hold enough space for the forthcoming permanent tooth to erupt. Your child’s dentist will check the growth, development, and examine how your child’s teeth fit together at each teeth cleaning appointment. If your dentist observes early signs of crowding or malocclusion, they will provide you with a referral to an orthodontist for a free consultation. 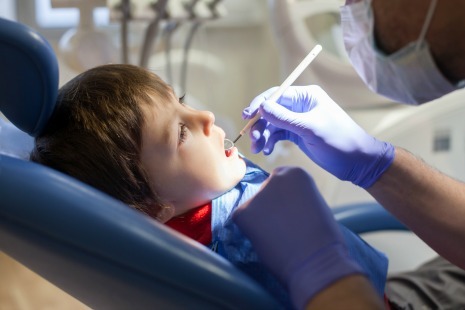 Advancements in bite science and technology enable dentists to intervene while your child is still growing and “move” teeth into the ideal position for function and esthetics. 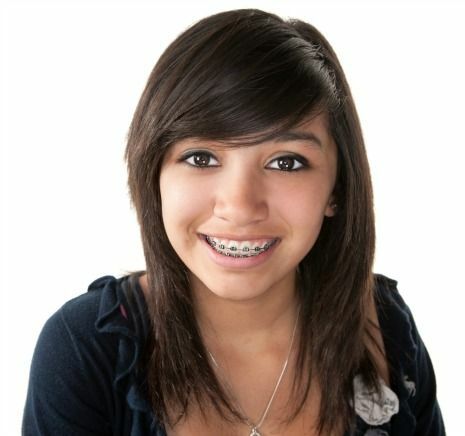 Dentistry for the Entire Family offers Invisalign braces. Not everyone is an ideal candidate for Invisalign. Dr. Thyra Jagger offers free consultations. Tooth decay, also known as a dental cavity, is the result of an infection caused by harmful bacteria plaque in the mouth and acids from food and beverages. 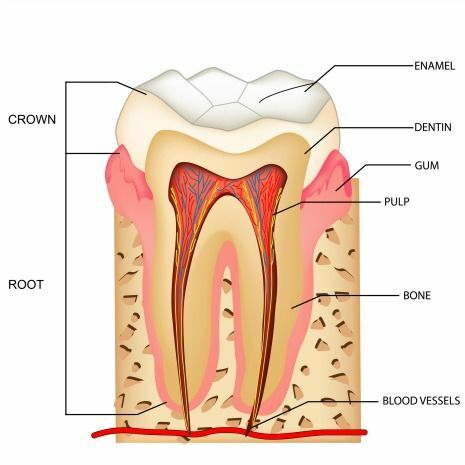 The result is a “hole” or “cavity” inside the tooth which requires your dentist to repair and place a dental filling. Left untreated, tooth decay will progress and become a painful toothache for your child. 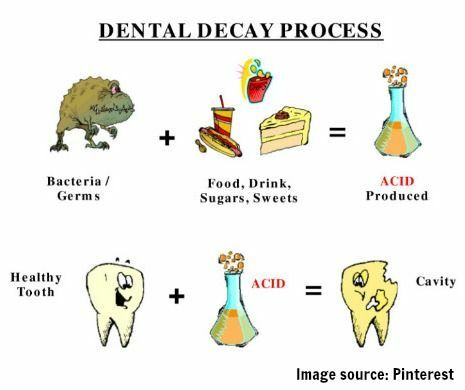 Teeth are exposed to acid every time a food or drink is consumed. Sugar and starches in the food mix with the harmful dental plaque to produce acid that weakens the integrity and strength of tooth enamel. Repeated “acid” attacks will result in a decayed tooth. 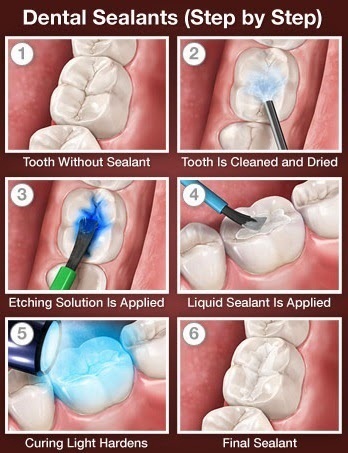 Dental sealants reduce dental caries by 80%! A dental sealant is a thin, barrier or coating that is applied the deep pits and grooves of permanent back chewing molars to help prevent tooth decay. Dental sealants are recommended because toothbrush bristles cannot effectively reach and clean debris from these hard to reach surfaces. 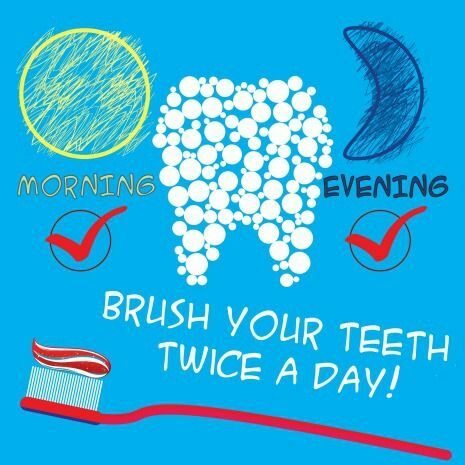 The ADA recommends that kids and adults brush their teeth and tongue two times per day and floss once daily. There are a number of different size toothbrushes depending upon the age and size of your kid’s mouth. Electric toothbrushes are a great option to consider if in the budget. Up until age 7-8 or the time that they can tie their shoelaces without help is when kids have the adequate dexterity to floss without help. 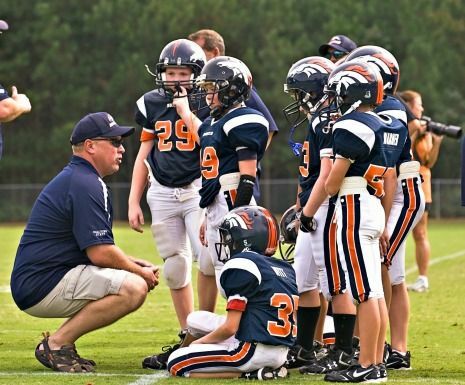 Kids who participate in contact sports should wear a protective mouth guard to help safeguard their teeth from injury. Mouth guards that are custom fabricated by your dentist are superior to those available over the counter. Football, hockey, rugby, are high contact sports with an increased risk for concussion. Mouth guards from your dentist will be fabricated according to guidelines set forth by the Academy of Sports Dentistry. ← Tongue 101: Facts. Function. Care. Disease.